Deborah Yeh, SVP of marketing and brand at Sephora, gave Retail Dive a glimpse into three of the retailer's most dynamic marketing moves. The floor is a checkerboard of glossy black and white tiles leading to a central red table with five bar stools per side and accompanying iPads. This is where customers come to learn more about products, how to use them for various purposes and, perhaps most importantly, to experiment. Store associates are there to answer questions and help the customer's experience along, keeping a record of the products tested and talked about for the shopper to take with them. That way, a customer will remember which products they tried out, what worked and what didn't, without having to rely too much on their own memory. Is this the store of the future? No, it's a Sephora Beauty TIP workshop. In fact, it's not even the newest concept from the beauty retailer. 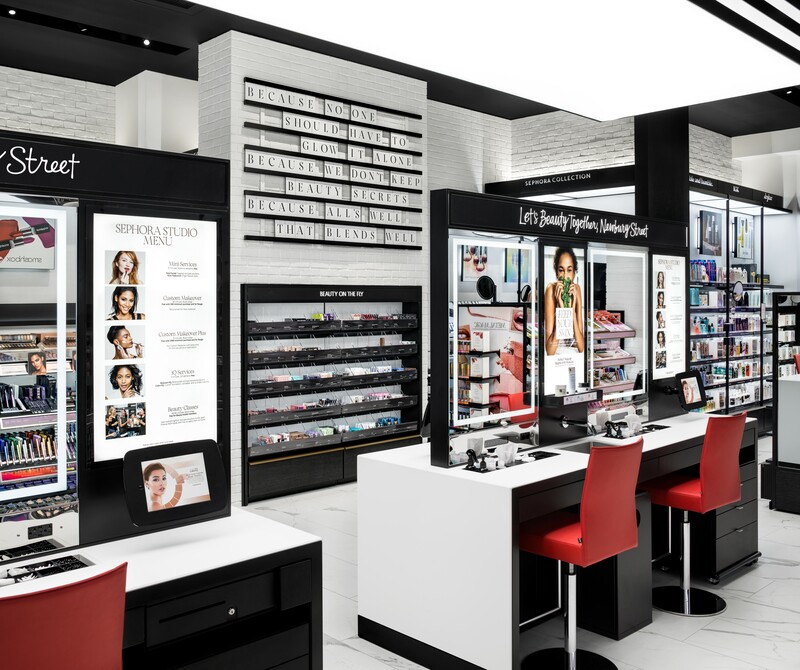 The Beauty TIP concept was introduced in 2015, with the first store opening in San Francisco, and later rolling out to more locations. Since then, Sephora has launched the first "Sephora Studio," a small-format store on Boston's Newbury Street which opened this July, and the Beauty Insider Community, a social platform for Sephora's clients to talk about everything from product recommendations to styling techniques, which launched in August. Each concept has been laser-focused on the experiential, the engaging, the often overlooked element of fun that goes into the shopping process — and it's working. The concepts are winning over customers (or, beauty lovers, if you're Sephora), leading the beauty retailer to expand concepts and drive ever more innovation. So what's the purpose behind these stores, what do they add to the 'Sephora experience' and where is Sephora striking next? Deborah Yeh, senior vice president of marketing and brand at Sephora, gave Retail Dive a glimpse into Sephora's strategy to drive the customer experience and form personal customer connections. The first of Sephora's experiential concepts, the Beauty TIP workshops are focused on three core concepts: teach, inspire and play. The idea is that customers will enter, perhaps with a general idea of what product they're looking for (e.g. foundation) or a certain look they're going for (e.g. cat eye), and either individually or with one of Sephora's 'beauty advisors,' they'll be able to experiment and play around with different brands, colors and textures to their satisfaction. A customer conversion isn't front-and-center in these stores and that's probably for good reason. Sephora needs sales like anyone else, but the focus of these workshops is on customer interaction and experience — essentially, a place where customers are "playing with beauty products and celebrating their learning and successes," Yeh said. That focus also led the company to start offering free classes in stores, the majority of which started in 2015, which range from basic skin and beauty care to more advanced techniques. Customers can sign up for the classes online, 14 of which are currently on Sephora's website, including everything from "teen makeup" and "no-makeup makeup" to "contour and highlight" and "winged eyeliner." "We want to make sure that we are catering to not just folks who are the ultimate beauty junkies but also people who are early in their beauty journey and exploring beauty for the first time." "We want to make sure that we are catering to not just folks who are the ultimate beauty junkies, but also people who are early in their beauty journey and exploring beauty for the first time," Yeh said, noting that Sephora has an exceptionally broad audience to address. Offering beauty classes not only gets customers in the door, but it also gives them something more than just a product to walk away with. Similar to Lululemon's approach, which was to feature yoga teachers in stores and turn them into brand ambassadors that could both sell clothing and offer free classes, Sephora's beauty advisors are there to give customers an experience first, and sell them a product second. But even outside of scheduled courses, Sephora stores are looked at as hubs of learning and experimentation — something that is bolstered by the use of in-store tech. Take, for example, Sephora's color IQ technology. If a girl walks in looking for foundation, a beauty advisor can scan her face in three different places to find what should be the perfect foundation for her skin tone. "It's a combination of human and technical interaction because, yes, we get the colors absolutely, scientifically precise, but there's a conversation about what kind of foundation finish she wants or what kind of format she wants. Does she want a powder or a liquid?" Yeh said, stressing the importance of thinking about technology and store associates "in balance." It's not all about fancy new tech, though. Sephora's Beauty TIP workshops are designed to be interacted with. Stores with skincare studios will be attended by working sinks and stores with fragrance sections will be attended by "the whole wheel of scent families," allowing customers to sniff to their heart's content when they're looking for a new fragrance. In fact, much of the in-store space is given over to experiences. "We've got, probably, in these stores, the highest density of make up seats or beauty seats, meaning there's lots of opportunity to sit down and interact, get a free 15-minute express service or sit down and actually have a full 60-90 minute consultation and makeover," Yeh said. That kind of experiential retail is hot these days, especially with the millennial and Gen Z cohorts, the former of which are more likely to buy from brands that are not only more humanized, but also focus on transparency, experience and community rather than just quality. Gen Z is following suit, and more experiential forms of retail (think Warby Parker and Bonobos showrooms or subscription services like Stitch Fix) are striking a chord with those generations. "One of the beautiful things about being in such a personal retail category is that there are human interactions happening all the time — and not just at a cash wrap." That being said, not every consumer is going to want that kind of personal, customized attention. 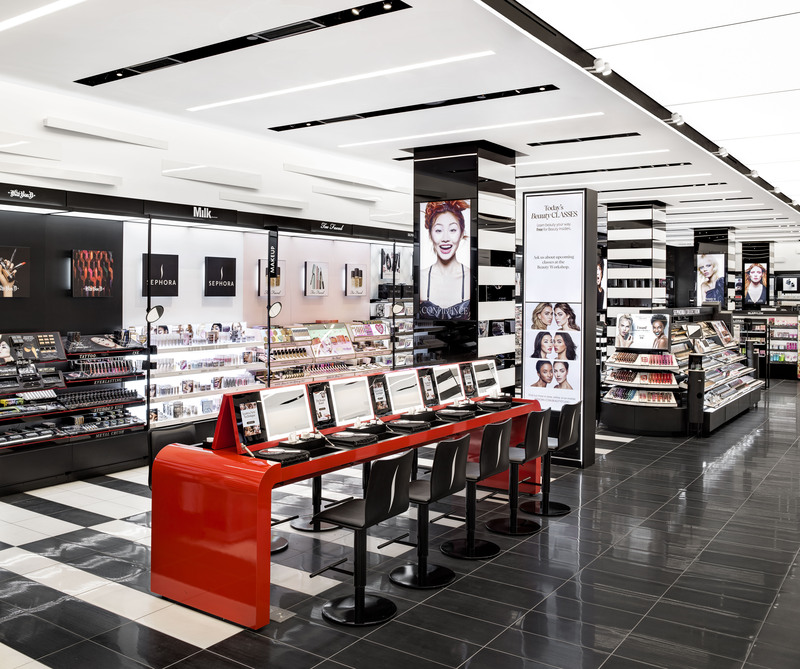 Sephora tries to cater to those who don't by offering a host of digitally-enabled processes, so a customer can experiment in more of a self-service fashion. Still, the company is highly focused on using knowledgeable store associates to drive the in-store experience — especially in the Beauty TIP concept. "One of the beautiful things about being in such a personal retail category is that there are human interactions happening all the time — and not just at a cash wrap," Yeh said. "They're happening in the aisles, in the beauty studios... and so each of those touch points becomes an opportunity for inspiration for us from our consumer." Sephora Studio: generating an "inclusive neighborhood feel"
Newbury Street in Boston is a hip shopping street, filled with small boutiques and big name players (including Muji's flagship store), cafes and plenty of tourists and locals alike. It's also the location of Sephora's small-format "Sephora Studio" concept store. Though predicated on the same idea of personal, experiential retail, the Sephora Studio is much smaller and more targeted than the Beauty TIP workshops. At around 2,000 square feet of selling space, it pales in comparison to the retailer's new New York City store, which totals more than 11,300 square feet. That contrast is purposeful, however. Unlike the Beauty TIP workshops, Yeh said the Sephora Studio is meant to play host to more of an "inclusive neighborhood feel." The two concepts do share many similarities, however. The life and soul of the Sephora Studio, at least as Sephora envisions it, is a pair of beauty studios at the center of the store which offer up eight seats for customers to explore and interact with Sephora's beauty advisors. Even the staff at this store are held to a higher threshold, earning the "highest level of certification that employees can earn from Sephora," according to Yeh. "So really the opportunity here is to make that long-term connection with the client," Yeh said. "She has the ability to come in and from skincare all the way through makeup get a full consultation with one of those beauty advisors." The hope is that a given customer will have more than one consultation with the same beauty advisor, forming a connection that lasts over the weeks and months to come, rather than a simple one-time experience. The concept isn't dissimilar to Nordstrom's new merchandise-free concept, which the company referred to as a "neighborhood hub" and is likewise built on the premise of repeat visits and free consultations (with Nordstrom and Trunk Club stylists). And similarly to Nordstrom's concept, these smaller Sephora stores aren't meant to replace full-line stores. The intimacy of the small-format concept was inspired by the location itself, which influences all of Sephora's decisions about where to expand their store footprint, from regular stores to Beauty TIP workshops. "For a location like Newbury Street, where the dominant retail environment is more intimate, we knew that we needed to give her something special and more curated." "In a busy downtown shopping area like Powell [San Francisco], we know that she is looking for something exciting and comprehensive," Yeh explained of a typical Sephora customer. "For a location like Newbury Street, where the dominant retail environment is more intimate, we knew that we needed to give her something special and more curated so it's a direct response to what we're hearing from our consumer." Part of that more catered experience involves Sephora's Virtual Artist tool, an augmented reality feature that lets customers try on a certain look or style of makeup before committing to it. Ideally, the process eases communications between store associates and customers by making sure both are on the same page before moving forward. In fact, augmented reality is just another aspect of retail where Sephora's gotten a headstart. With a series of feature updates and releases in the past few years, the beauty retailer has jumped ahead of other retail sectors, which are just now getting involved in augmented reality. While Sephora couldn't share any metrics, Yeh said that customer reactions to both the store concepts have been incredibly positive and that the company plans to expand Sephora Studio in the future, wherever "the real estate speaks to that kind of footprint." More than anything, though, the company has been excited about the emotional reaction of customers — a metric that the company calls "love." "'Do I love Sephora and is it my favorite beauty retail destination?' We're seeing great response on love as well," Yeh said, explaining that they measure 'love' mainly through post-purchase customer surveys. "All of these different tools that we use will gauge not just, you know, are people spending money at Sephora, but also how do they feel about Sephora? So we spend an extra effort getting those overall attitudes." 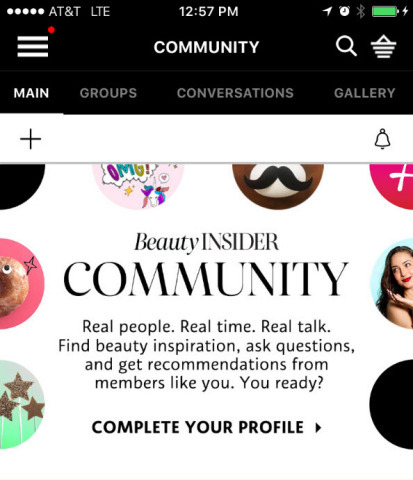 The Beauty Insider Community: a forum for "real talk"
With so many digitally-enabled processes in place, Sephora's members-only social platform, dubbed the Beauty Insider Community, fits right in with the brand's tech-focused image. While many of the capabilities were available before this specific launch, the company brought in some new features as well, like a chat feature that lets users talk to each other about products before making a purchase. "You can hear from other like minded users and pose a question. Like, 'Hey, curly-haired girls, I'm looking for a solution for breakage,' or 'hey, oily-skinned girls, anyone have any foundation recommendations,'" Yeh explained of the chat feature. "So we really wanted to enable this real talk between clients in the beauty insider community." Since the social platform launched in August, the beauty retailer has seen over 100,000 live chats started on product pages, with the majority of customers' questions being answered within minutes. On top of that, users have shared over 20,000 photos on the platform — what Yeh calls "great initial indicators of a rabid and enthusiastic audience." Going social is a good move for the retailer, especially as young audiences like millennials and Gen Z grow up. For those generations, social platforms can have a serious impact on purchasing behavior, from the 80% of Gen Zers whose purchases are influenced by social media to the 72% of Instagram users who have made a purchase based on something they saw on the platform. They're certainly not alone in the space, either. A study by digital research firm L2 found that a full 70% of brands use Instagram influencers to push their products, an indicator of how powerful that platform can be with young users — members of Gen Z actually value social media over deals when it comes to making purchases. For Sephora specifically, the Beauty Insider Community was a response to an audience that was becoming ever more digitally-savvy. "A retailer's work is never done, especially at Sephora — we never hit pause on our innovation pipeline." "Our client base is increasingly mobile-first and because of that, so are we," Yeh said. "So there are significant efforts to optimize all of our digital content and experiences to be mobile-friendly so that they seamlessly fit into the client's life." The Beauty Insider Community was a direct effort on that front and an attempt to give Sephora's customers access to all of these features "at her fingertips." Still, it can be an effort for any marketer to keep up with their consumers and make sure they're giving their customer whatever it is they're looking for: only 22% of CMO's feel skilled at emotionally engaging their customer. For Sephora, that means keeping in touch on the field level — Yeh gets weekly reports from the retailer's field organization about what they're seeing and feeling in stores and the company frequently taps into survey results to see what customers are saying about the "Sephora experience." "A retailer's work is never done, especially at Sephora — we never hit pause on our innovation pipeline," Yeh said. "It's something that is really part of the Sephora culture: to be in relentless pursuit of new tactics that are just going to improve our client relationships and make their experience with Sephora even better."